If you ever decide to go to the Bahamas, Pig Beach is a place you must visit. This is where you will get the chance to hang around with wild pigs. It must be a real fun to see pigs splash in the beautiful turquoise water like they are dolphins, or see them chilling in the shade on their idyllic island. These happy creatures are actually very strong swimmers. They are well-adapted to the island which is officially known as Big Major Cay, and are always happy to welcome new tourists. Whenever they see a yacht coming they plunge into the water and swim hundreds of feet up, hoping to get some snacks from the visitors. They are really friendly, you can feed them or join them for a swim. If you are the lucky one to make them feel comfy in your presence, you can make an unforgettable photograph with your pig buddy. There are many different stories about how the pigs ended up on this island. One story says that they were left on the island by sailors who planned to keep them as a good food source, but, luckily, they never came back. There is another story about pigs having been the only shipwreck survivors. Whatever the story, these cute creatures live in luxury now and are protected by the locals who feed them as well. 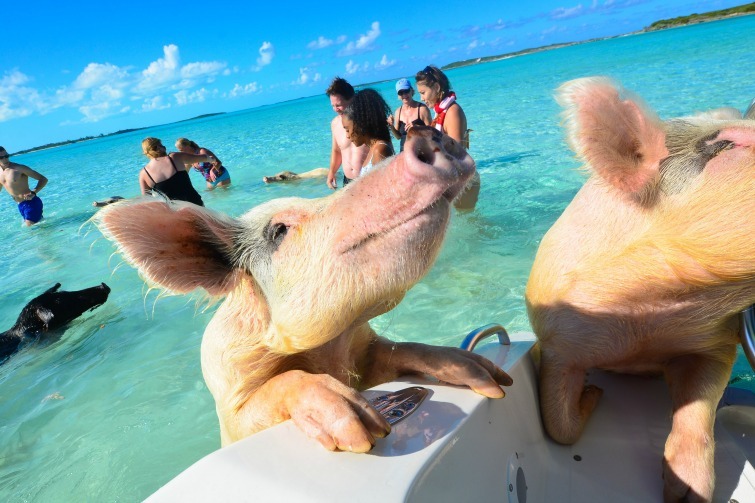 This tropical island, especially the Pig Beach is truly a paradise on earth for both humans and these adorable piggies. Who wouldn’t like to take a swim in this crystal clear water of the Bahamas! Watch the video and see how these pigs welcome their new guests.